In development scenarios where things can't be run in a debugger, or when you run the risk of masking the problem, logs are the greatest source of information about running a program. 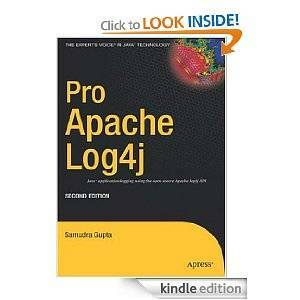 Pro Apache Log4j, Second Edition provides best practices guidelines and comprehensive coverage of the most recent release. Step by step, the book explains core concepts, from basic to advanced. Code samples are in Java and include guidelines for different application-specific needs. You’ll also learn how to extend the API to write custom components and best practices for using the feature-rich log4j API. This book concludes with enterprise Java applications using log4j with JSP and J2EE. Table of Contents Introduction to Application Logging Understanding Apache log4j Destination of Logging—The Appender Objects Formatting Logging Information in log4j Filtering, Error Handling, and Special Rendering of Log Messages Extending log4j to Create Custom Logging Components Complete log4j Example Log4j and J2EE Using the Apache Log Tag Library Best Practices and Looking Forward to 1.3 About the Author Samudra Gupta has more than eight years of experience in Java- and J2EE-related technologies. At present, he is working as a Java/J2EE consultant in the United Kingdom through his own company, SSG Solutions Ltd. His domain expertise is in the public sector tax and information content management systems, retail industry, and e-commerce-based applications. He holds a post-graduate degree in information technology and management form All India Management Association, New Delhi. Gupta actively contributes articles to Web sites, magazines, and journals such as JavaWorld and Java Developer's Journal, and is a monthly contributor to JavaBoutique. When not programming, he loves playing contract bridge and 10-pin bowling.